This is an age of plentiful “fake news” that takes many forms. A nice batch has emerged with the now frequently encountered use of the word “meddling.” On an almost daily basis the politicians and media castigate Russia and Putin for “meddling” in the 2016 U.S. election. Meddling is a “snarl word,” with negative connotations, so that in a properly working propaganda system the word will only be applied to enemy and targeted countries, not homeland leaders, whatever the facts. And the facts are such as to make this double standard droll, as they require an amazing level of distortion and suppression. They also make the great indignation at the alleged Russian meddling a marvel of hypocrisy and self-deception. Russia’s intervention in the 2016 U.S. presidential election is, in fact, questionable, and, for the serious charges, apparently fabricated. The charges arose after the June 2016 disclosure by Julian Assange that WikiLeaks was about to release a batch of Democratic National Committee (DNC), Hillary Clinton and Clinton campaign manager John Podesta’s documents showing that the DNC was illicitly serving Clinton’s campaign, with actions and claims damaging to the rival Bernie Sanders campaign. A “dossier” was quickly put together by a hired group that featured an alleged Trump-Russia connection, based almost entirely on hearsay evidence from alleged Russian insiders. From this point on the Clinton campaign featured the Russia link and Trump as a “Putin puppet.” That theme was quickly taken up by the mainstream media (MSM), with the support of the CIA and other intelligence agencies. The key supposed truth of Russia’s intervention was provided in the January 6, 2017 release of an Office of the director of National Intelligence (ODNI) report on “Background of Assessing Russian Activities and Intentions in Recent U.S. Elections.” This ridiculous document spends more than half its space describing the Russian-sponsored RT-TV Network, which it considers a part of a Russian “influence campaign” designed to help Trump and discrediting Clinton. But the “assessment” offers no semblance of proof that there was a planned “campaign” rather than an ongoing expression of opinion and news judgments. As regards the ODNI’s proof of a more direct Russian “meddling” in the U.S. election, the authors concede the absence of “full supporting evidence,” but they provide no supporting evidence—only assertions and “assessments,” as in “We assess that…Putin ordered an influence campaign in 2015” designed to defeat Clinton, and “to undermine public faith in the U.S. democratic process,” but it provides no evidence whatsoever for any such order. It also offers no evidence that Russia hacked the DNC computers and the Clinton and Podesta e-mails, or that it gave hacked information to WikiLeaks. The report itself includes the amazing statement that “Judgments are not intended to imply that we have proof that shows something to be a fact.” This is a denial of the credibility of its own purported evidence (i.e., “assessments”). Furthermore, if the report was based on “intercepts of conversations” as well as hacked computer data, as the media and ODNI claim, why has the ODNI failed to quote a single conversation showing Putin’s alleged orders and plans to destabilize the West? Julian Assange and former British diplomat Craig Murray have repeatedly claimed that these sources were leaked by local insiders, not hacked by anybody. And the veteran intelligence agency experts William Binney and Ray McGovern also contend that the WikiLeaks evidence was surely leaked, not hacked. The FBI never examined the DNC computers to obtain forensic evidence of the source of the leak or hack, but simply accepted the word of the DNC and its private source. It is also notable that among the three intelligence agencies who signed the ODNI document, only “moderate confidence” in its findings was expressed by the National Security Agency (NSA), the agency that would most clearly be in possession of proof of Russian hacking and transmission to WikiLeaks as well as any “orders” from Putin. 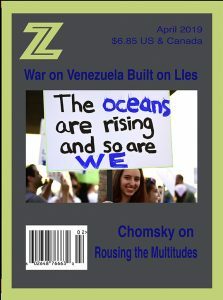 As no hard evidence has yet been provided in any “assessments” of the Russian hacking and transmission to Wikileaks, this looks very much like a case of “fake news” rather than “meddling.” The MSM have not demanded evidence, and they simply ignore the likes of Binney, McGovern and Assange as they blindly follow this new war-party line. They play dumb on the CIA’s hugely costly “slam dunk” lie on the Iraq weapons of mass destruction just a few years back, the long history of the CIA’s institutional lying, and ODNI head James Clapper’s March 12, 2013 notorious lie to congress, also not so long ago. The MSM also swallowed the lie that the January 6th Assessment was the consensus of all 17 security agencies. It was in fact not even the unfiltered product of the three actually involved (CIA. FBI and NSA), but was eventually admitted to have been produced by a small set of agents “hand-picked” to do this job. The NYT eventually admitted its error in using the 17 figure, but moved instead to a “consensus of the intelligence agencies,” still an implicit lie with the ambiguous “consensus” still suggesting all of them. An interesting feature of the agonizing over the alleged Russian intrusion into the 2016 election is the failure to raise the question of whether the United States does the same to them and others. In fact, we intervened heavily in the Russsian election of 1996 to assure the reelection of the very subservient Boris Yeltsin, and no questions were raised about the appropriateness of this in the MSM at the time or in the context. 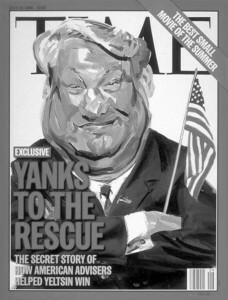 Time Magazine even had a front-page celebratory cover on July 16, 1996 showing Yeltsin waving a U.S. flag, with the accompanying article disclosing how extensively U.S. advisers worked in the election, including the dissemination of “negative ads.” This 1996 election aid also included the U.S. arranging a large IMF loan in support of Yeltsin. The difference in treatment of this massive U.S. intervention in Russia and the much less extensive alleged Russian meddling in the recent U.S. election could hardly be more dramatic. And across the board the United States outclasses Russia and its predecessor, the Soviet Union, in both the number, and frequency of resort to violence, in their interventions in foreign elections. The Soviet Union did intervene decisively in making any elections in nearby client states nominal, ratifying authoritarian rule, but only the United States has been a global intruder in foreign elections. In defense of U.S. intervention in foreign elections, U.S. officials and MSM propagandists stress our reliance on “soft power” and “democracy promotion,” providing information and organizational resources to out-of-power democrats. This of course ignores the numerous cases of U.S. “hard power” interventions, some of which caused vast destruction and very large numbers of civilian deaths. It also bypasses the selectivity in the use of soft power, which is not applied in Saudi Arabia or post-coup Ukraine, but lavishly in pre-coup Chile (1971-1973) and in pre-coup Ukraine (2013-2014). U.S. soft power and “democracy promotion” has also been employed in Russia during the post-Yeltsin years. In fact, the U.S. National Endowment for Democracy (NED) did direct business in Russia, until 2015, when it was shut down as an “undesirable” under legislation enacted that year. The NED is a spinoff from the CIA, founded in 1983 and funded by the U.S. government. Can you imagine a spinoff from the KGB being allowed to function in support of dissident political and human rights groups in the United States? Even if registering as a foreign agent? Putin’s poll ratings in Russia run about 80 percent favorable; Yeltsin’s were under 10 percent in 1996 prior to the massive U.S. intrusion. But presumably with enough truth-telling via NED and other forms of “democracy promotion” Russians would see the light and oust the bad man. Gershman and the Post have also failed to note that the Russian law requiring the registration of political activists receiving foreign funding was modeled after a U.S. Foreign Agent Registration Act. Gershman also declared that these Russian laws violate international law. The double standard is clearly thriving (see Robert Parry, “Key Neocon Calls on U.S. to Oust Putin,” Consortiumnews.com July 23, 2017). Getting back to the alleged Russian hacking in the 2016 election, if valid wouldn’t that be a nice case of “democracy promotion,” where the intervening party helps bring to public attention relevant facts about the hidden biased performance of the DNC and the content of Clinton‘s remarks to Goldman Sachs? In fact, the focus on the alleged Russian role did an outstanding job of burying the pro-democracy aspects of the alleged hacking, while also helping advance the program of the war party. Edward S. Herman is Professor Emeritus at the Wharton School in Pennsylvania. He is a journalist, author, media critic, and political economist.